Sign up for Broadjam today to follow Eftos, and be notified when they upload new stuff or update their news! if you do not beat them all, you failed. Intolerable Shockwaves. 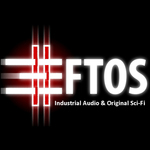 Eftos forces EBM into Noise.